If only by the heaps of accolades reaped through the years, Davao City simply leads the way. Davao is one of the most peaceful cities in the World with a monthly crime index of 0.8 cases per 10,000 persons per month. Its Davao Police Office is a consistent top pick for the Country’s Best Police Office Award. The City has also established the 911 central communications and emergency response center in 2002 to lessen crime incidences as well as preserve lives and properties. According to Numbeo, the world’s largest database of user contributed data about cities and countries worldwide, Davao City ranked as the 9th safest city in the world. As of April 30, 2015, Davao City garnered 80.71 Safety Index. 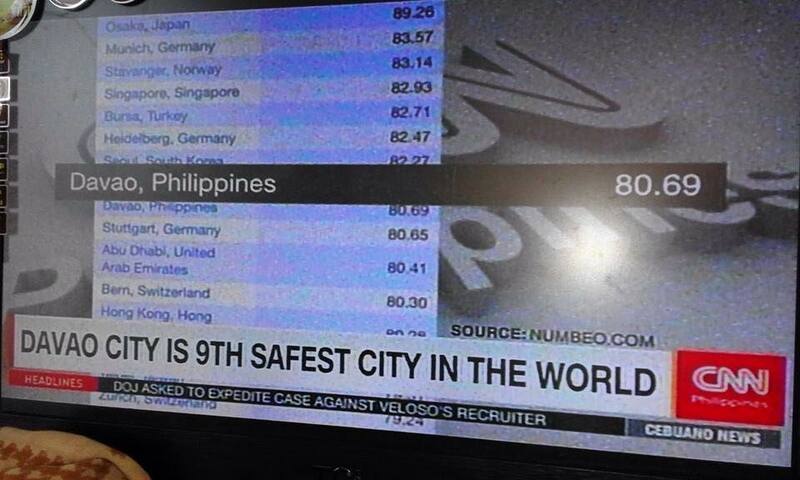 It is the only city in the Philippines that made it to the top 100. Osaka, Japan ranked first on the list with 89,26 index; followed by Munich, Germany with 83.57; Stavanger, Norway with 83.14; Singapore with 82.93; Bursa, Turkey with 82.71; Heidelberg, Germany with 82.47; Seoul, South Korea with 82.27; Bergen, Norway with 80.98; Davao City; and Stuttgart, Germany with 80.65. Numbeo shares current and timely information on world living conditions including cost of living, housing indicators, health care, traffic, crime and pollution. Numbeo says it uses the wisdom of the crowd to obtain the most reliable information possible. 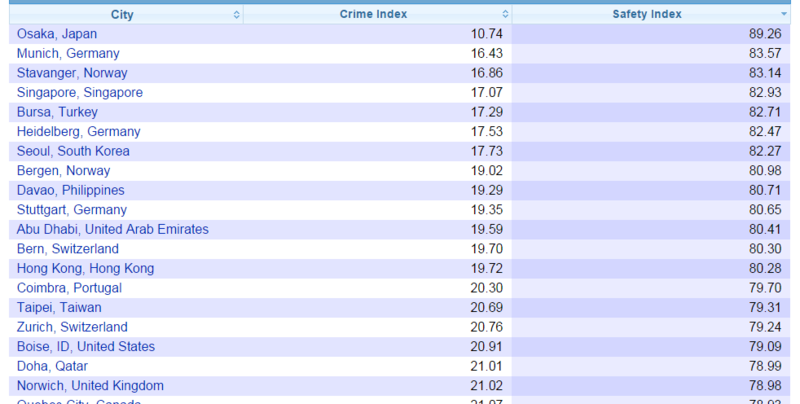 For the complete list of Safest Cities in the World, click HERE.